OO Gauge Winter Wonderland diary build coming soon. 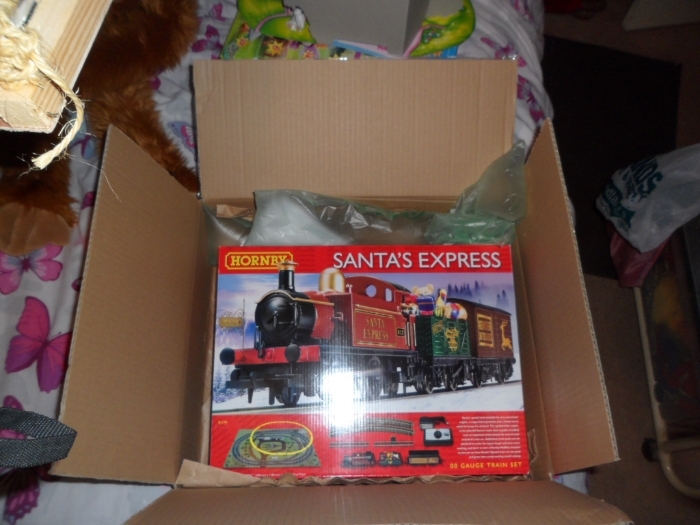 Ok, so Jess my wife has really twisted my arm in purchasing an 00 gauge train set. Have only got N gauge since moving in my current bungalow due to lack of space. 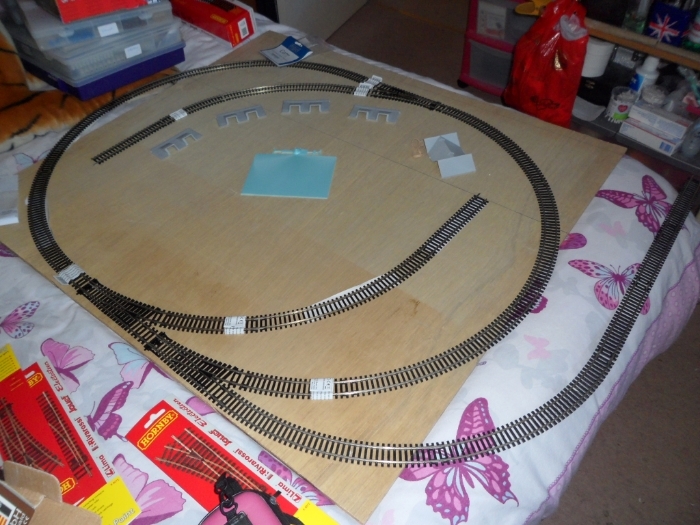 So I search the internet for a small 00 layout but one that is a bit interesting, an oval shape with a couple of sidings. It should fit on a 3 X 4 board which is not too large. Like I've said, the above is just what we got from a brain storming session. Please feel free to add anything that might be of interest. I'm also going to have to fit in some safety features, with breaks in some of rails especially in the siding with a diode fitted to prevent the trains hitting the buffers and also just before the points to stop any derailments, especially if the points are incorrectly set wrong with the train going in the wrong direction. Last edited by royjess on Tue Dec 30, 2014 2:34 pm, edited 1 time in total. The build is still in the planning. 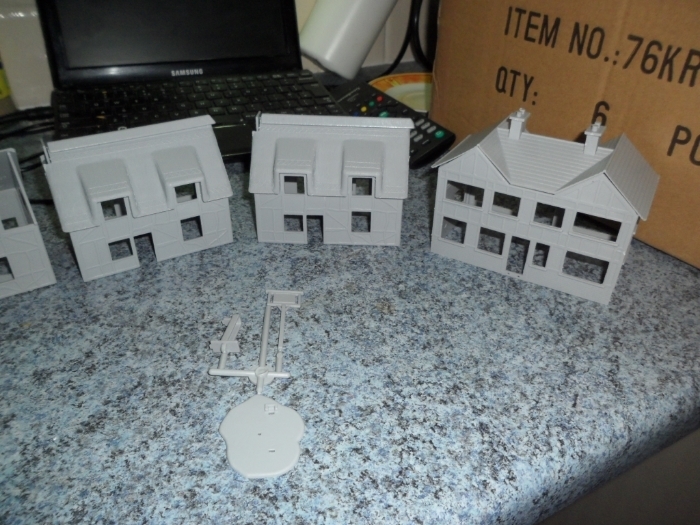 I've just done a quick mock up with the track and some cottages and Inn roofs (still need to paint and build these). The blue type plastic is going to be used for the ice skating pond. The photo gives a rough idea and the buildings and pond may be position differently in the final build. The board is a bit on the small side, but this board was originally cut for another one of my N gauge build which is still in the pipeline. I'll need to make a bigger base board before I really continue. Hi Roy and Jess ! I see from the "pics" that you use "ready made" tracks, have you ever considered making your own ? using PCB and separate rail lengths ? Manoverboard wrote: Hi Roy and Jess ! I've only ever used PCB when making modular boards to reinforce the track ends where the boards join. Oh by the way, thanks for your interest. I cut my teeth on OO gauge railway models. got really good at it. 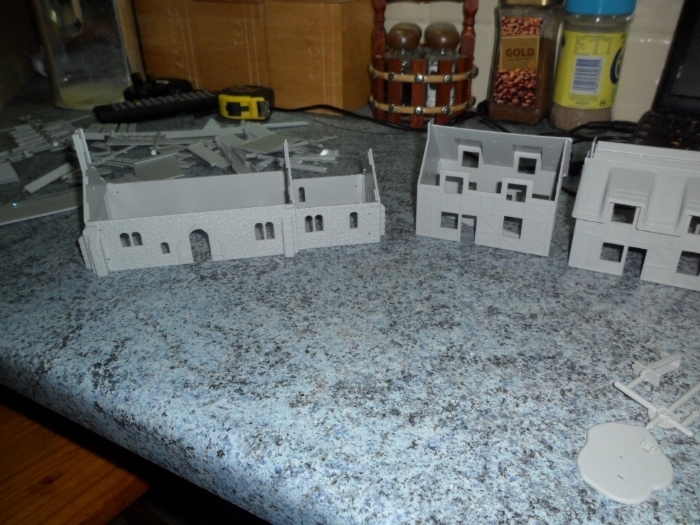 Today I found some time to start on the buildings. These have been partly glued together and now going to paint these before I glue any more together. 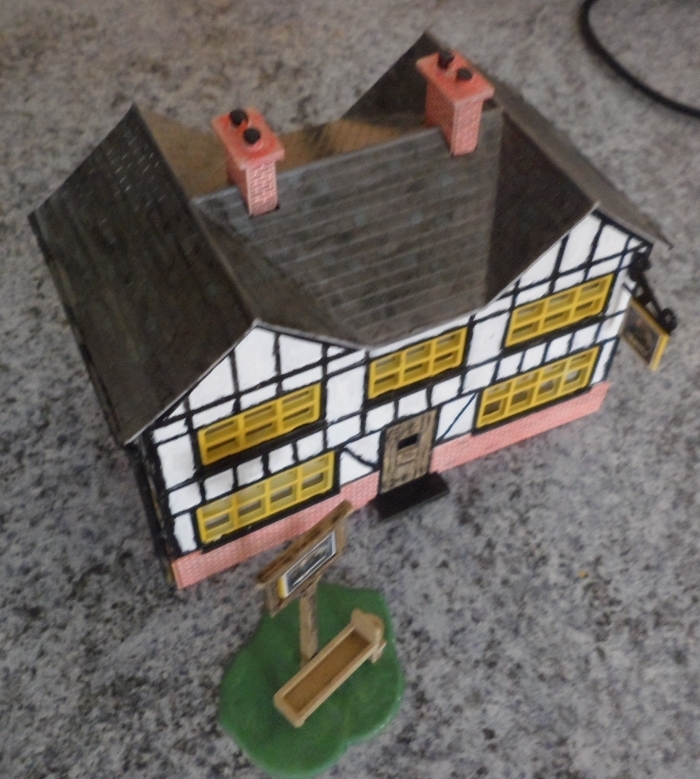 There is a Church, three cottages, an Inn/Pub, a pub sign and a trough. All Dapol kits. Those Dapol kits are the old Airfix toolings from the 70's. Nice buildings, even if the moulding it a bit crude by today's standards. I reckon that will be a cracking (sorry no puns on crackers) set for Christmas, possibly underneath the tree (?). 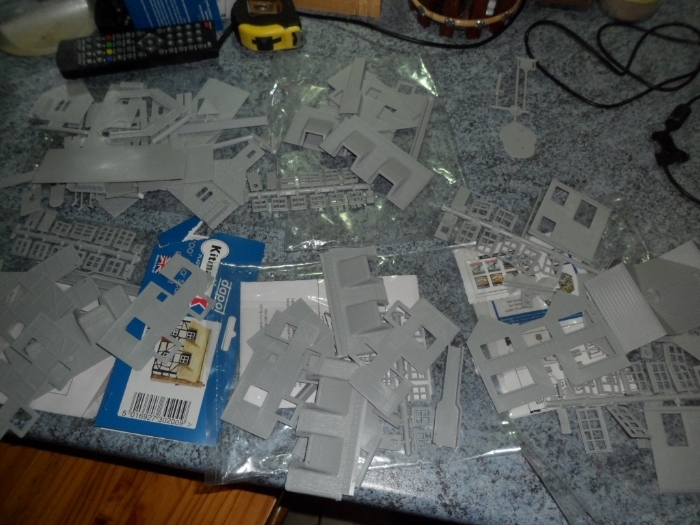 Mark wrote: Those Dapol kits are the old Airfix toolings from the 70's. Nice buildings, even if the moulding it a bit crude by today's standards. I never seem to have a problem with the old toolings am I missing something? 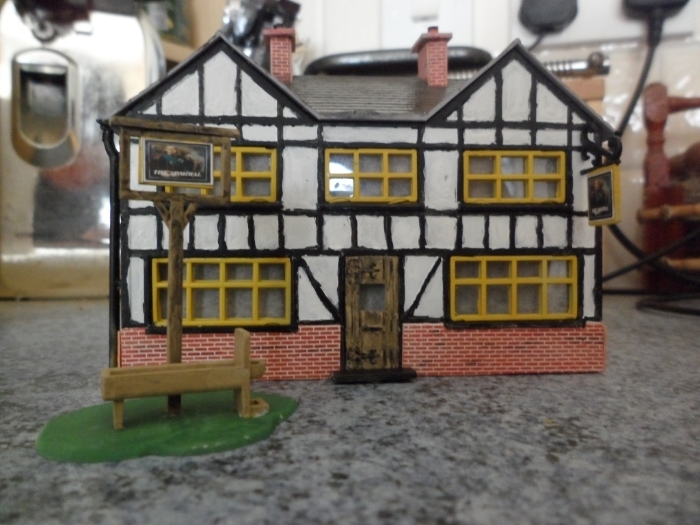 Just finished the Inn/pub. I've also lined this with black card for when I illuminate the interior of the buildings. The roof will eventually be covered in snow. 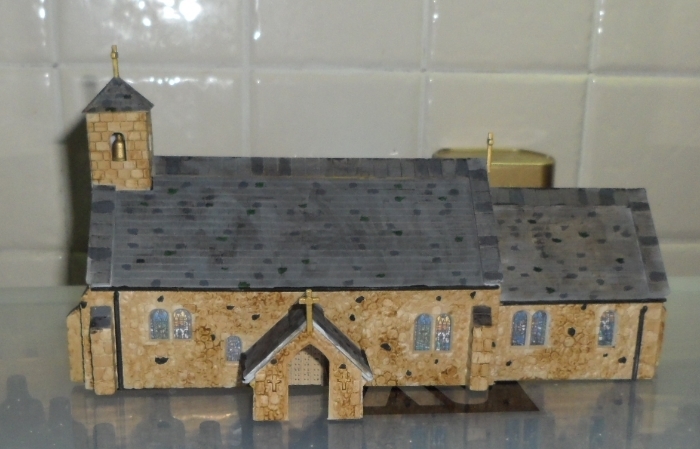 The church has just been completed. Again the roof will have a layer of snow on it. I found some stain glass images on the web and I scaled these down and printed them off. They look good when a light is shone through them. 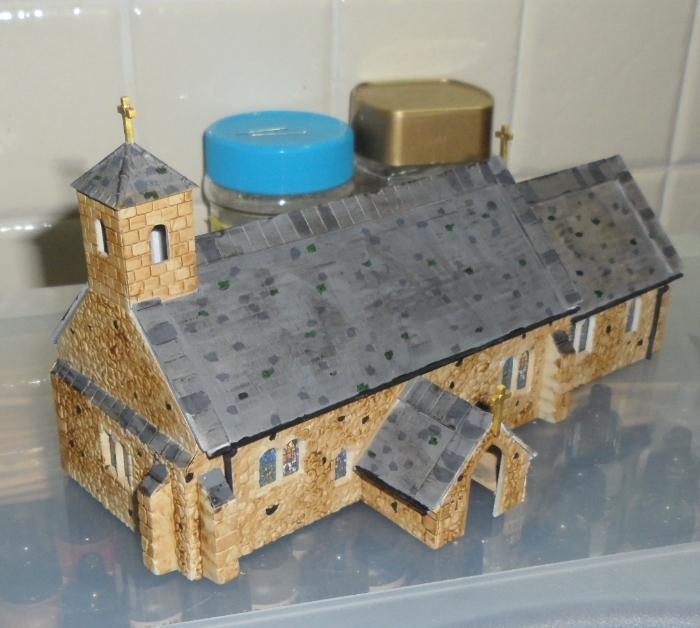 I've also lined the church with black card for illuminating. 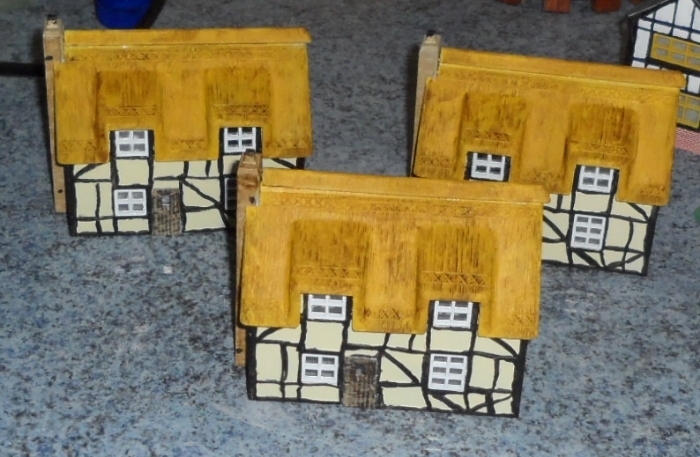 I've just completed the cottages. The only thing I need to do with these and that is to line them with black card to block out the illumination lights. Looking really good Roy Love the church. whats the pub called? where weary modellers can rest their feet and hand's with green cocktails on tap.